Casio Cloud Suite consists of a series of separate modules which can be selected individually to provide you with a total solution. 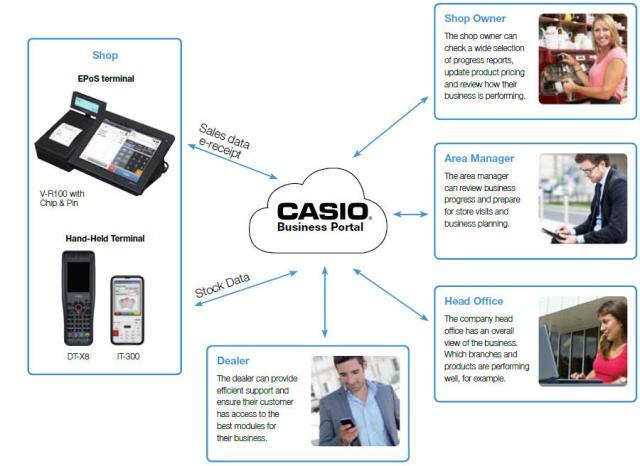 The Casio Cloud Software interacts in real time to record sales registered on the Casio VR-100 POS Terminals, available on the Casio V-R700 by the end of 2014. The basic suite consists of the core module and this can be enhanced to the graphical Dashboard module allowing your business to benefit from instantly being able to view; utilize and print a variety of management reports. This information and control can either be single or multiple branches and users so that the information and branch data can be restricted as required enabling the right people to access the appropriate information. A non-graphical standard sales report with Product / Department / Group / Clerk / Parameter / Set Menu / Keyboard maintenance. This is your starter module to enable basic product maintenance and sales reporting. Graphical views in the form of bar graphs/ Pie charts and many others. This allows more in-depth reporting with sales profit and item detailed sales, along with charts to be able to view and “drill down" into the reports. The ability to be able to create and maintain mix and match promotions; e.g. buy 3 items and get a 10% discount. The ability to control a number of branches, with sales information available per branch and consolidated into one report. The ability for many staff to be able to log onto the cloud at the same time, giving you the ability to be able to view only certain parts dependant on the requirements; i.e. Manager; basic sales and reports; owner product maintenance. The ability to be able to enter orders and deliveries; to carry out stock takes to compare theoretical with actual stock; generate actual profit reports before and after a stock take; Wastage control. The ability to be able to collect sales of items scanned that are not in the Product file (NFP) and to be able to create price encoded barcodes such as deli items which are weighed and a bar code produced by a scale. Additionally, the production of shelf-edge labels. The ability to have an easy interface into web based systems to enable a customer who has a store and an online shop; stock to deplete automatically from the VR cloud solution when purchased online. The ability to be able to manually sell a product in the VR cloud solution and to raise an invoice for VAT purposes. The ability for sales/program data to be exported/imported so to enable interaction with other systems; Also, the ability to export in various formats including an import into Sage and other accounts software. Proper cashing up procedure carried out on the cloud, enabling actual cash to be counted and entered onto a daily sheet; data of which will be compared to the actual cash sales recorded by your V-R100 EPoS terminals. Ability to create a graphical floor plan on the VR which can be easily changed by the user. The ability to be able to prepare and send emails and texts to end user customers, informing them of special promotions that will apply to their buying trends. Customer file data will interact with the customer files on the VR-100 giving a level of centralised loyalty for the multi store customer. To enable staff to be able to clock in/clock out; possible labour scheduling so to be able to ascertain the staff cost against the proposed turnover and profit. The produce reports to include hours worked. The ability to be able to carry out stock taking/Ordering/Deliveries/transfers/price checking (scanning)/shelf edge label production (scanning) from DT-X8/IT-300.